An Awesome Con Gone By! That was an awesome first Ro-Con. Thank you to everyone who came and helped make it awesome. We'll have a more comprehensive thank you after we recover a bit. It was wonderful to have you all help us run the hottest con around! Ro-Con 3 will be July 21-23, 2017, tentatively at the same hotel, but after they have had a year to remodel, renovate, and install the AC. There will also be air conditioning. We are still working on all the details, but we have selected a Guest of Awesome whom we will announce shortly. We will also have an Historical Inventor of Awesome: Willis Carrier, the inventor of the air conditioner. Come back next year for the coolest con around. If you like to get a jump on things like we do, the panelist application for Ro-Con 3 is ready. Click here for it. Oh, and I almost forgot to mention, we'll have air conditioning in the hotel next year. 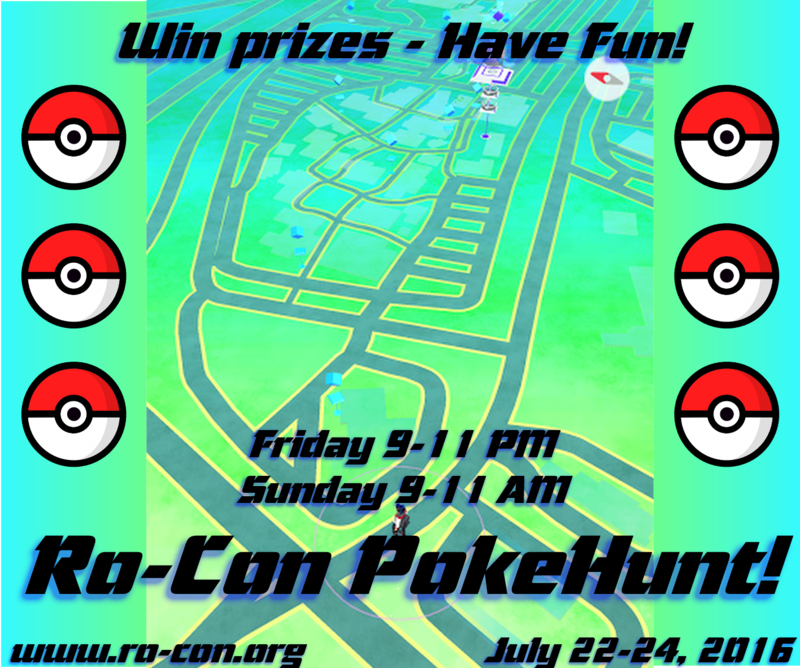 Ro-Con will be hosting two PokeHunts during the convention. The hours are due to the expected popularity. We don't want to draw attendance away from all the other great programming. There are two ways to win: Most total Pokemon caught and Most different Pokemon caught. 1) All players must start at the Ro Desk at 9:00. No prior sign up necessary. 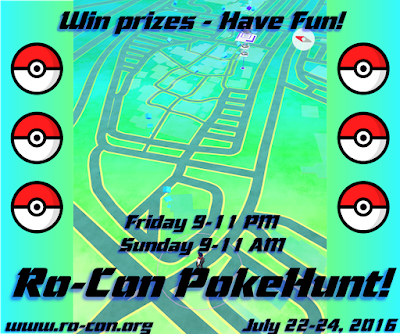 2) Must be registered for Ro-Con to participate. 3) Players must be back at the Ro Desk for counting by 11:30 for their captures to qualify. 4) Captures will be counted based on the Journal in the Pokemon Go app, and only captures between 9:00 and 11:00 will qualify. 5) In the event of a tie, winner will be based on highest CP captured. 6) Breaking any laws or otherwise making a nuisance of yourself will be grounds for disqualification from the Hunt. 7) Cheating, hacking the app, or interfering with other competitors will be grounds for disqualification from the Hunt. There will be prizes. They will be awesome. We haven't confirmed what they are yet. While there may be minor modifications, the schedule is final enough to share with the masses! The schedule is organized as one track of panels (multiple participants), one track of presentations (focused single presenter), plus some round tables and an outdoor demo or two that may involve swords. Additionally, we have a game/food/consuite room and a vendor room with 12 awesome vendors.